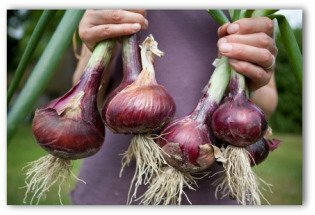 Here are a few easy tips for storing onions grown in your vegetable garden! Learn important steps for how to harvest and store onions for winter use. Learn why curing and drying onions before storage is vital for long-term storage success. All members of the onion family are closely related including the chives, leeks, shallots, and garlic yet their flavors are diverse. Luckily, harvesting and storing onions is pretty much cut and dried across the separate species. For harvesting, either wait until the onions break over of their own accord, or if the tops begin to turn yellow, flatten them by hand. Sometimes onions send up a seed stalk and it might be tempting for you to cut it off. If you do so, the hollow stem may fill with water and rot the bulb. The best idea is to pull the onion for immediate use or bend them over to crack but not open the stalk if more onions are sending up seed stalks than you can presently find uses for. When you dig onions, they should be allowed to cure for several days. If the sun cooks the produce before you do, they spoil quickly. Now that you have picked storage baskets full of your onion crop, the next step vegetable gardening step will be properly drying prior to storing. In late summer when the spring planting of sets and seedlings mature, the onion harvest is in full swing. First cure the harvested onions by allowing them to dry in the sun for a few days. The purpose of curing is to dry the outer layers of skin to protect the inner layer. 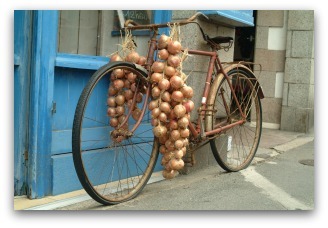 After curing, pick a place for storing onions with good air circulation. 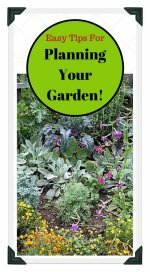 You can hang them on strings in a dry basement or shady garden shed. The bulbs will remain in the warm, dry spot where they will be stored for four to six weeks. When the skins are completely dry and crisp, and the tops have withered, store the onions in a cool, airy location for use throughout the fall and winter. As you pull your onions, you will probably notice that the stalks of some are thicker than others. Sometimes they are called thick-headed or bull-headed. With onions like these you will discover that they will not store as well as those with stalks that shrivel away completely. 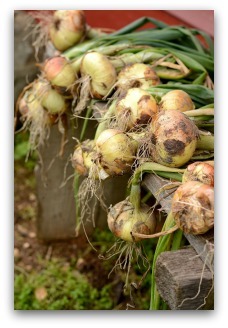 The best vegetable gardening advice is to use the thick stemmed or bull-headed onions first. If you want to store your onions in an open mesh bag, cut off the stalks about one inch or two above the bulbs when you pull them. 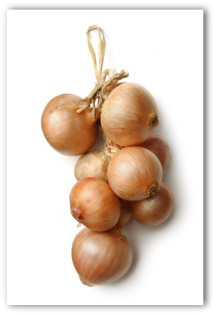 Storing your onions can also be easily done by braiding them so the bulbs can be hung in an airy place. If you want to braid them, do the braiding soon after digging because the stalks will still be relatively supple. 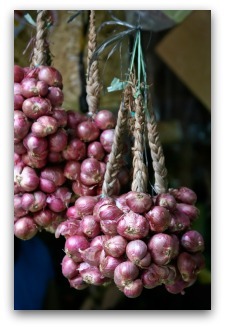 Hang braids of onions on the north wall of a garden shed to prevent the sun from spoiling the bulbs. * The Stuttgarter Giant onion is a popular Dutch import. The onions are smooth, sweet, and mild-tasting. The bulbs will keep in storage for several months. If kept cool and given air they will hardly sprout at all. 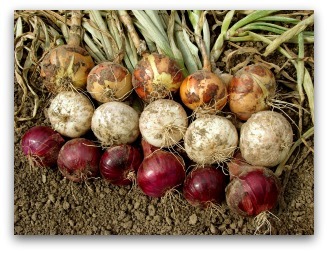 * Avoid piling freshly picked bulbs more than two deep when drying before storing your onions. 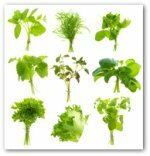 Without adequate air circulation, the produce is apt to start new root growth in the dampness, or even worse, to rot.